Now, in a new study published Nov. 7, 2018, in the Proceedings of the Royal Society B, a team of Wisconsin researchers documents that woodland hawks—once in precipitous decline due to pollution, persecution and habitat loss—have become firmly established in even the starkest urban environments, thriving primarily on a diet of backyard birds attracted to feeders. 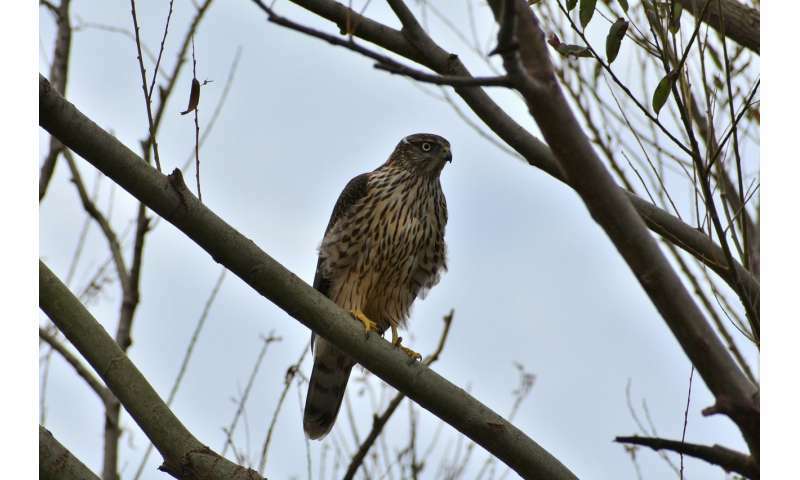 According to the researchers, the birds are doing so well that an increasing number of rural woodland hawks are, in fact, city-bred. "Top predators are beginning to use urban areas more frequently and establish breeding populations, and hawks are a nice example of this," explains Benjamin Zuckerberg, a University of Wisconsin-Madison professor of wildlife ecology and a senior author of the new study. "For hawks, the secret is out: There is a hyperabundance of prey" in the city. The availability of food—in this instance, backyard birds—is the single most important factor in drawing avian predators such as Cooper's and sharp-shinned hawks to the city, says Jennifer McCabe, a UW-Madison postdoctoral fellow who led the new study. As pesticides such as DDT were curbed and new protections from human hunters came into play beginning in the 1960s, populations of woodland avian predators like Cooper's and sharp-shinned hawks have soared. As populations rebounded, hawks began to move into urban areas and the study concludes that, at least for Chicago, prey availability at feeders significantly influenced colonization and persistence in the city, explains McCabe. While the new study uses Chicago as its laboratory, the phenomenon of top predators establishing themselves in urban environments is a global trend, say the Wisconsin researchers. "Across the world stories are popping up about predators expanding into cities," says McCabe. "Bear and cougars in the U.S., leopards in India, and red foxes in Europe, to name a few." The new study depended on more than 20 years of citizen science data gathered by participants in the Cornell Lab of Ornithology's Project FeederWatch, where people who feed birds document avian activity in their backyards. "Project FeederWatch is the perfect program for this kind of research because you can use that information not only to document hawks, but also their prey," says Zuckerberg of the landmark citizen science project. Quintessential woodland predators, Cooper's and sharp-shinned hawks are what wildlife biologists call "perch and scan" hunters, sitting quietly on a tree branch and swooping in when a meal comes within striking distance. "Bird feeders," says Zuckerberg, "are like buffets. It is an easy meal." The new insight from the Wisconsin study is that for the hawks it is all about food. Once established in cities, the urban environment and the absence of trees made little difference. "I was surprised that tree canopy cover was not important in colonization by these woodland hawks," McCabe says. "However, they aren't nesting in the winter, meaning they are more concerned about their own survival and not raising young. So it makes sense that food availability would be so important." Using 20 years of Project FeederWatch data from 1996 to 2016, McCabe and her colleagues portray a steady advance of the predators from outlying rural areas to the hardened center of Chicago, a pattern that also occurs in many other North American metropolitan areas and also in Europe, where sparrow hawks have aggressively colonized urban landscapes. One other surprising finding, according to McCabe and Zuckerberg, is that prey size did not seem to be an important factor. The informed assumption, says McCabe, was that larger prey would be preferred menu items for the hawks. "Prey biomass wasn't an important driver of colonization or persistence," she notes. "Much of the literature states, at least for Cooper's hawks, that they prefer larger-bodied prey like doves and pigeons. Perhaps these hawks are cueing in on the sheer number of birds and not particular species." An important take-home message, says McCabe, is that cities, which in the United States are adding an estimated 1 million acres of urbanized land each year, are increasingly important wildlife habitat: "Don't discount urban areas as habitat. The more we know about which species and what landscape factors allow those species to colonize and persist in urban areas, the better we can manage wildlife in an ever-developing world." Since this article is about "woodland hawks", I believe the poster may have found it efficacious, to use a photo of an actual "wooland hawk", rather than a vulture. Although Terry Devitt has no brain for birds, he/she is an obvious bird brain.